Dave Shoji's Rainbow Wahine squad starts practice for the 2007 season on Wednesday. UH is favored to win the WAC again. The success came quickly and often. Four national championships in nine years, runner-up trophies three other times between 1975 and 1988. 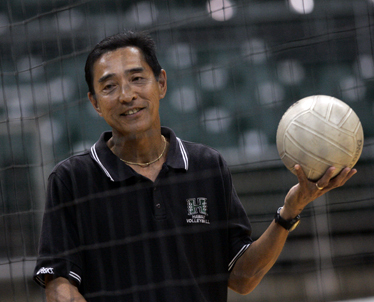 After winning the NCAA title in 1987, Dave Shoji didn't expect that it would be 20 years before his Hawaii women's volleyball team won another. The 2007 edition of the Rainbow Wahine look to end that drought, starting with the first practice Wednesday. "Once you win, you always think you're going to win again," said Shoji, beginning his 33rd season at UH. "And you never think it will take 20 more years. But the game and scope have changed so much. There were a number of years we were good enough to win but didn't. And it's even harder to repeat." Hawaii, with a mixture of veterans, newcomers and a new setter, will challenge defending national champion and preseason favorite Nebraska on Oct. 21 in Lincoln. It's a rare nonconference trip on the road in midseason. "Why not play the best team in the country at their place, in an environment where you're not supposed to win?" he said. How to regroup after the graduation of one of the greatest setters in the program's history? Simple. Keep the tradition going. Life will go on this season for the Hawaii women's volleyball team, as it has for the past three decades. The void left by four-time All-America honoree Kanoe Kamana'o will be felt, just as were the losses of other great setters like Joyce Kapuaala Ka'apuni, Martina Cincerova and Robyn Ah Mow. The Rainbow Wahine have survived, each time compensating for a perceived weakness with strength in other areas. This year should be no different. What Hawaii lacks in experience at setter will be made up for with a veteran lineup anchored by dynamic outside hitters and solid middle blockers. "At this point, I'm very optimistic of our chances to be a good team," said Hawaii coach Dave Shoji, who is beginning his 33rd season. "We have a veteran team. There's some youth that might be able to help us, but the bulk of our starters are veterans who know what it takes to win. "We know our setting needs to be better, but we have a few weeks before that first match. It will be adequate to start and we have to be happy with adequate for now." Nothing like on-the-job training. The Wahine come into Wednesday's first practice with two setters: redshirt freshman Dani Mafua and sophomore transfer Stephanie Brandt, who started last season for UC Santa Barbara. That position battle is expected to be a season-long one. Even more heated will be the one for libero, with five viable candidates in the mix, led by returning sophomore starter Jayme Lee. Lee played in all 35 matches last season, starting the last 34 at libero, and earned a spot on the Western Athletic Conference's all-freshman team. Among her competition are senior Raeceen Woolford, junior Elise Duggins and Elizabeth Ka'aihue, a freshman recruited specifically for the position, despite being an outside hitter at Punahou. "I'm excited about the opportunity," the 5-foot-8 Ka'aihue said. "I don't think I could play hitter at this level. I'll be doing my best to become the best libero I can be. "Competition (for playing time) is always good." Ka'aihue is one of three true freshmen on the 18-player roster, The others are athletic outside hitters Amanda Simmons, 6-3 from Illinois, and 6-2 Stephanie Ferrell from Los Angeles. With the return of all three players who were injured during last season -- middle Nickie Thomas and outside hitters Tara Hittle and Jessica Keefe -- there is likely no room for any new walk-ons. Shoji, who likes to carry 18 on the roster, wasn't sure if he'd end up redshirting any of his freshmen. "We'll evaluate over the next few weeks," Shoji said. "I don't know yet." The same can be said for his starting lineup. Except for senior middles Kari Gregory and Juliana Sanders, and junior left-side hitter Jamie Houston, the rest of positions are "wide open," Shoji said. Sophomore Amber Kaufman, pressed into action as a freshman because of injuries, is a strong candidate on the right side. So, too, are Keefe and sophomore transfer Aneli Cubi-Otineru, who sat out last season after playing at Southern Idaho as a freshman. Despite the question mark at setter, Hawaii again was the overwhelming favorite to win its 12th consecutive WAC title in the recent coaches' poll. Shoji, who could not vote for his own team, chose San Jose State -- with new coach Oscar Crespo -- as his top pick. "San Jose has the most returnees and they might surprise some people," Shoji said. "There's a lot of changes in personnel in the WAC. New Mexico State has reloaded with transfers and there's a lot of new players on the other teams." The Wahine went 29-6 last season, seeing their WAC winning streak snapped by NMSU at 114 but coming within one victory of the final four. It could be another roller-coaster ride this year ... for the entire country. "There is a lot of parity," Shoji said. "There's two obvious favorites in Nebraska and Stanford. After that, there's probably six, eight schools who could win it. "In terms of the national picture, we have to be mentioned ... along with Penn State, Texas, Florida, UCLA and Washington. You look at our team and see that we have a number of veterans along with talented young players whose best volleyball is still ahead of them." Tickets to go on sale: Individual match tickets go on sale tomorrow. There are also season tickets available. "There are really good seats in the lower bowl that are not normally available," said Shoji, adding that season-ticket sales were down for this year. "It's a chance for people who couldn't get those seats before to get them now." Hawaii led the country in attendance for the 13th consecutive season, averaging 7,186 in 2006. Defending national champion Nebraska was second at 4,137. » State has priciest milk in the U.S.